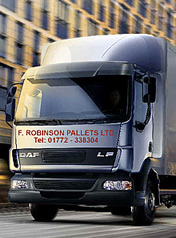 Whatever your pallet requirements F.Robinson Pallets can help. With over twenty-five years experience we are able to offer a bespoke Pallet Design Service, concentrating on attention to detail and your budget requirements. Ensuring that you receive the products you want - when you want them. The F. Robinson Pallets Fleet of vehicles are always available to deliver your products on time in Preston and throughout the whole of Lancashire and the North West. Waste Timber Recycling - We Care Because You Do. We care about the environment at F Robinson Pallets and with new improvements in Waste Timber Recycling and combined with new legislation introduced, we ensure that as much used pallets that are beyond repair are recycled and re-used in an environmentally friendly way. Website developed by NetWise-IT. All images,etc. are copyright of their respective authors.